Couldn't tell you a whole lot about DAVID ALLAN COE before I heard this collection, just that he was one of those Texan redneck outlaw types that got lots of self-proclaimed hellraisers at his gigs & who looooved to tell you about much he looooved his whiskey. 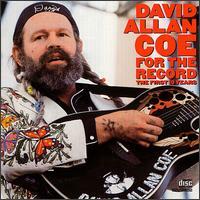 Interesting, though, as I plowed through this CD I decided to check out some stuff online & found that someone registered www.davidallancoe.com and is trying to link Coe with JOHNNY REBEL, the notorious racist fake country singer. Coe, on his own site, is working at distancing himself from the racist stuff and says, "I, (DAC), AM NOT JOHNNY REBEL. NEVER WAS & NEVER WILL BE!". OK. Then there's this CD. I'll tell you, I have swung from the highest highs to the lowest lows with this one. At first, primarily during his mid-70s stuff, the collection introduces us to a real funny drawler, with clever lyrics and a terrific barroom country sass. 1975's "You Never Even Called Me By My Name" and "Longhaired Redneck" have got to be classics in someone's book, I'm sure. Good times. Even his cover of "Please Come To Boston" is all right, and that song is middle-of-the-road garbage on a stick, right? There are times when this overview makes one think that Coe was one of the better-than-good ones we all need to get acquainted with. Then there's the rest of the CD. Start with "Divers Do It Deeper", one of the most godawful, innuendo-laden pieces of stupidity I've ever heard, like something the cocaine cowboys of Laurel Canyon might've dreamt up while snorting a barrel of blow off a mixing board with Don Henley, Lindsay Buckingham and the guys from Toto. As appalling as that is, the mediocrity that follows in the late 70s/early 80s is just maddening, particularly when he obviously could (and did) come back with good 45rpm material like "Now I Lay Me Down To Cheat" in 1981. For an outlaw, this guy really laid the hammy synths, the "fonky" country bass and operatic backing vocals on thick. I got called out behind the schoolyard when I made a similar career-sweeping, based-on-a-greatest-hits-record judgment about WAYLON JENNINGS some time back, but I think that Coe might've peaked early & fell hard. Tough to reconcile with the goofus image he still throws up to the people at the county fairs and livestock shows. I give it a C+ & pray to Jefferson Davis there's more to his shtick than this.